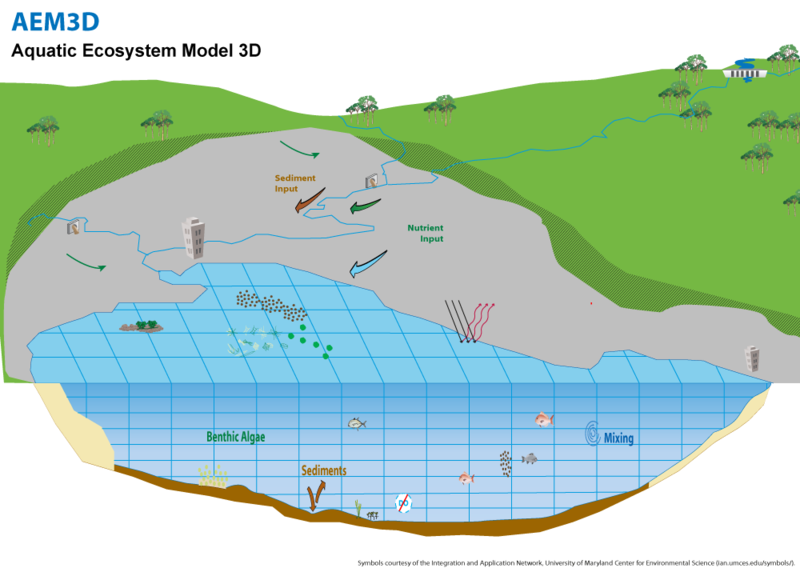 HydroNumerics develops, uses, sells and supports the 3-Dimensional coupled Hydrodynamic-Aquatic Ecosystem Model, AEM3D for simulating all water resources, including lakes, reservoirs, estuaries and coastal oceans. This model is based on the internationally recognised model ELCOM-CAEDYM developer by the Centre for Water Research. HydroNumerics staff were integral in the development of ELCOM-CAEDYM and continue to develop and improve AEM3D and provide support to third party users. AEM3D is used to simulate the velocity, temperature, salinity, nutrients and biogeochemistry in surface waters that are subjected to environmental and anthropogenic forcing such as wind, tides, surface heating and cooling, inflows, withdrawals, bubblers and mixers. It is s designed to simulate over timescales of days to years and at spatial scales of metres to kilometres. AEM3D is suited for simulation of transport, mixing, stratification, tidal exchange, inflow dynamics, and dispersal conditions under a range of flow regimes. AEM3D can be run either in stand alone hydrodynamic mode or as a fully coupled hydrodynamic biogeochemical model. 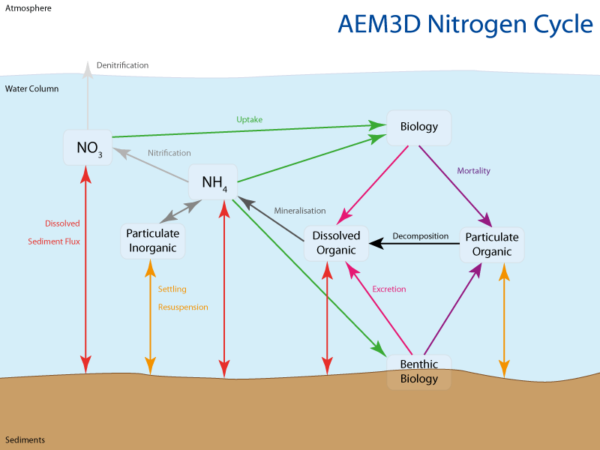 AEM3D includes a library of algorithms that represent the key biogeochemical processes influencing water quality under the simulated physical conditions. This includes primary production, secondary production, nutrient, carbon and metal cycling, oxygen dynamics and the transport and deposition of suspended solids. AEM3D provides flexible set-up options so a user can focus on processes of interest. 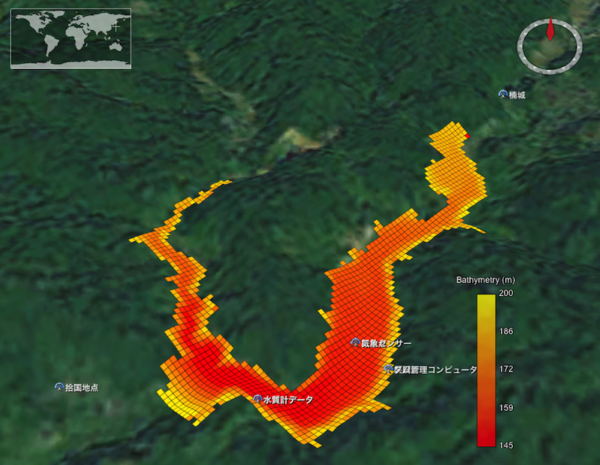 AEM3D houses a series of mathematical algorithms that represent biogeochemical processes that govern water quality including primary and secondary production, nutrient and metal cycling, oxygen dynamics and sediment interactions. AEM3D simulates variables at the chemical and biological species level (e.g. organic-labile and refractory and inorganic nitrogen, carbon and phosphorus species, dissolved and precipitated metals, multiple phytoplankton and zooplankton species, infectious and dormant pathogenic organisms, multiple sediment classes). 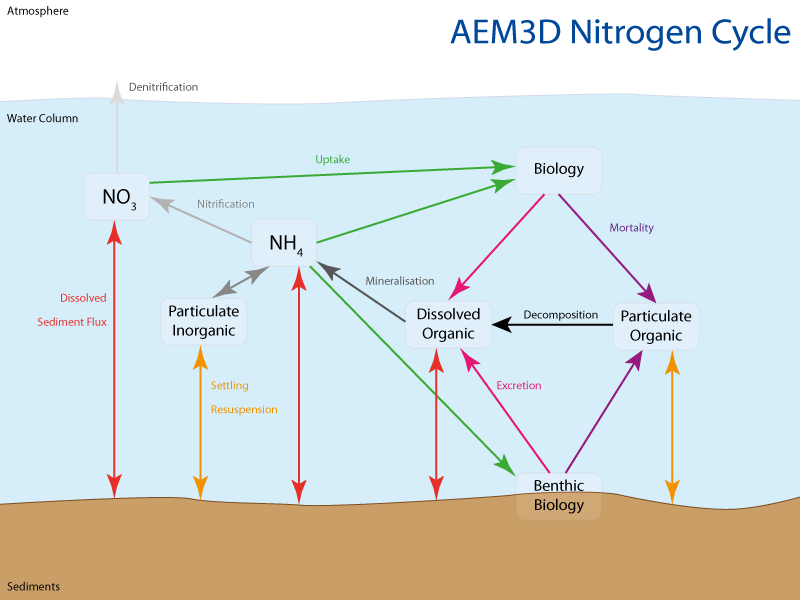 In addition, AEM3D solves for the atmospheric and sediment interactions of chemical species that is based on both physical mixing processes and chemical reaction, including microbial mediated chemical change. The rates of reaction are dictated by the water properties including species concentration, temperature and pH. The configuration of AEM3D is flexible so that the user can select to model the processes that are of interest or within the limitations set by the availability of data and parameters. The geochemistry model in AEM3D allows the user to choose the ’components’ to simulate, and then solves for the equilibrium speciation of the solution. The module will solve for pH and other solution properties, and optional mineral or gas phases can be included. Many kinetic transformations (e.g. redox reactions) between simulated components are also included. Metals may be simulated as part of the model and can also be active within the biological cycles. The module is flexible and simple in its configuration and can be used in the water column and in the sediment if the dynamic sediment diagenesis model is also being simulated. A seperate simpler metal and pH model is also available. Please contact us at [email protected] to discuss your training requirements. You must be a registered user to download the demo version. Windows users may need to download the Intel redistributable libraries found Here to run the OpenMP version. No dynamic boundary condition files. The AEM3D user manual is included in the Demo download. AEM3D is provided under a simple single-user licences costing $AUD100 (+GST if in Australia). Each license provides you with one year worth of updates and allows you to install the software on an unlimited number of machines for one user. For site or department wide licenses please contact us at [email protected]. We are open to providing source code access for users who we feel can make a contribution to the ongoing model development.